Scroll down for workshop descriptions and dates. 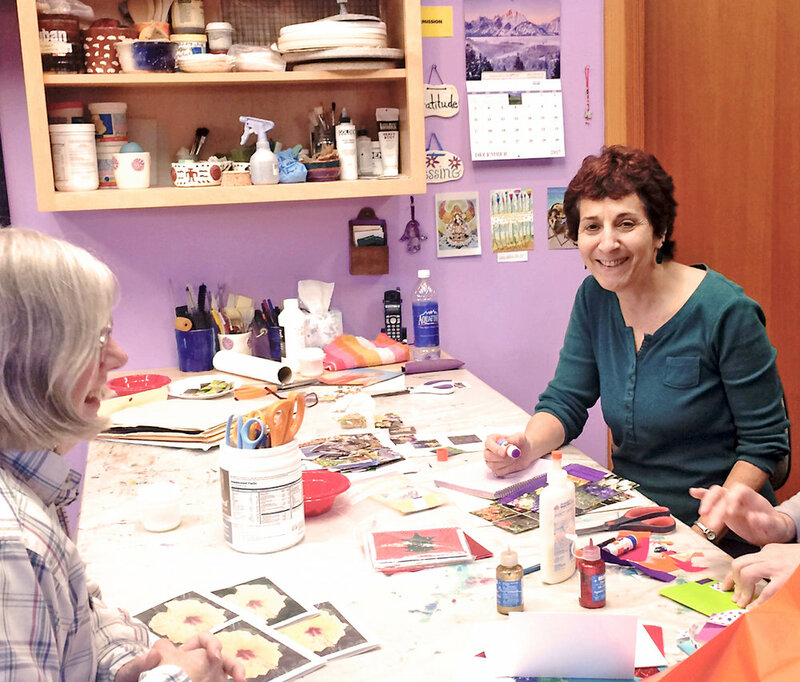 Most workshops take place in Rona's art studio in Palo Alto. Small groups for more individual attention. In this workshop learn a variety of collage and painting techniques using acrylic paint, colorful paper, texturing, and varnish. Students begin with practice boards to experiment with different techniques demonstrated by Rona. The final product will be on canvas, where the student is free to create any image they want. Come for a fun time of art making. Beginners or any skill level are welcome. In this fun and creative workshop decorate boxes with colorful paper, ribbons, sequins and more. This is a great way to make gifts for others or for yourself. Materials, including boxes, are supplied. The workshop is open and supportive to all skill levels. In this workshop create cards with colorful paper, stamps, ribbons, and other art materials. Bring your imagination and creative self! This is a great way to make cards for those special people in your life. The workshop is open and supportive to all skill levels. Creative Art Workshop - "Loving Who You Are"
A guided process to awaken Self Love, Self Care, & Self Appreciation through Art, Journaling, & Guided Meditation. Connect with your Creative Self! Spend a fun afternoon! Take time to appreciate the special person that YOU are in this reflective art experience. You'll be encouraged and supported to connect with your unique creative self. No art experience necessary; artists of all levels are welcome. Journaling, guided meditation, group sharing, art making and more will be included. Rona is experienced in this reflective and interactive process. She has a BA degree in Expressive Arts and an MS degree in Spiritual Science. It's her greatest joy to facilitate this workshop for the purpose of assisting others to discover their creativity and joy through art. Creative Art Workshop - "The Gift of Gratitude"
In this reflective and interactive workshop discover ways to bring gratitude to your life. We'll focus on what we're grateful for, while creating a daily practice to bring more gratitude to our everyday lives. Journaling, guided meditation, group sharing, art making and more will be included. Rona will guide you through this gentle process. You'll be encouraged and supported to connect with your unique creative self. All skill levels are welcome. Bring a pen, journal, and water. Rona is experienced with this reflective and interactive process. She has a BA degree in Expressive Arts and an MS degree in Spiritual Science. It's her greatest joy to facilitate this workshop for the purpose of assisting others to discover their creativity and joy through art. Mandala means circle and represents wholeness. The mandala appears in all aspects of life; the earth, sun, moon, and more. It is a circular design symbolizing life as never ending. Mandala art refers to symbols that are drawn or painted in a circular frame. Using symbols and colors that are meaningful to you; you'll create your own personal mandala using a variety of art materials such as, paint, colored pencils, markers, collage, oil crayons and more on a flat surface. There will be a short relaxation exercise prior to creating your mandala. Rona will guide you through this relaxing and centering process. The workshop is open and supportive to all skill levels. Acrylic paint is fun and easy when using rollers, sponges, droppers, scrapers, brushes, and more. Rona will demonstrate various techniques through out the afternoon. There will be plenty of time to practice techniques before you create your painting on canvas. This is a playful and explorative workshop. It's great for the beginner or experienced artist. In this creative and fun workshop, we'll dedicate the afternoon to creating holiday gifts and cards. You'll have the choice to make whatever you want; such as fabric and paper decorated cards, gift boxes, wall hangings and more. I'll provide suggestions, instruction and guidance. The sky's the limit! The workshop is open and supportive to any skill level. In this workshop learn this simple and fun technique. You’ll begin by creating backgrounds on either watercolor paper, or canvas board, using collage and paint. Your subject and composition will be created and come through magically by creating a contrast in colors. This is a great technique to explore your unique style of design. Rona will provide examples to inspire your imagination. Beginners and any skill level are welcome. "Thank you Rona for a wonderful afternoon, following your heart, inspiration, and sense of creativity." M.S. "Reminder to take care of myself, be where I am, take time to experience, draw and write." M.M.
" I enjoyed the art experience. It was fun." S. R.
" The workshop gave me the opportunity to step away from the normal daily tasks. " L.S.
" Validation, Inspiration, and Creativity." C.S. "Among a warm and friendly group of art-loving ladies. I felt comfortable and at home. Thought provoking concepts and mountains of lovely colored paper, paints, glue, other materials with a background of soothing music. What a great place to do art!" C.H.
" Reinforcement to be gentle with myself and help awaken the more intuitive side." M.H.
" Loved the opportunity and space and materials to play." D.D. "Calm, peaceful, welcoming environment. Relaxed." S.P. "Thank you so much for the workshop. The topic, the readings, and the art project were just perfect for me. They helped reinforce and solidify a forward movement for me. You made it safe and fun." D. D.
Any of my workshops can be set up for groups of three or more. Call me at 650-858-0589 to set up a workshop for you and your friends.